Going back in time just a few years, it seemed that the sadly underused Western genre was on the cusp of something of a renaissance in video games. 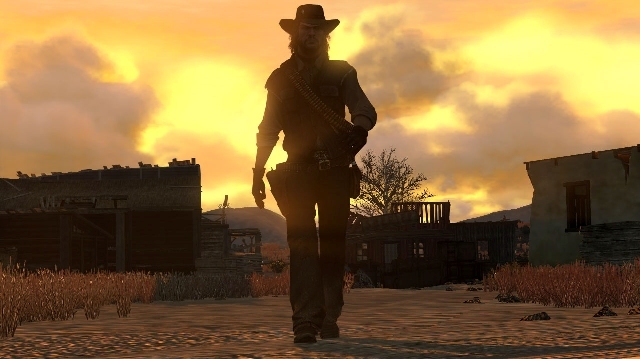 Blue Omega’s Damnation, Paradox’s Lead and Gold, Techland’s Call of Juarez and, of course, Rockstar’s Red Dead Redemption all emerged within a few years of each other. The expected resurgence never came, however, mostly due to the fact that the gulf in quality between Rockstar’s game and its inferior stable-mates is vast and unequivocal. But what is it that causes such disparity? 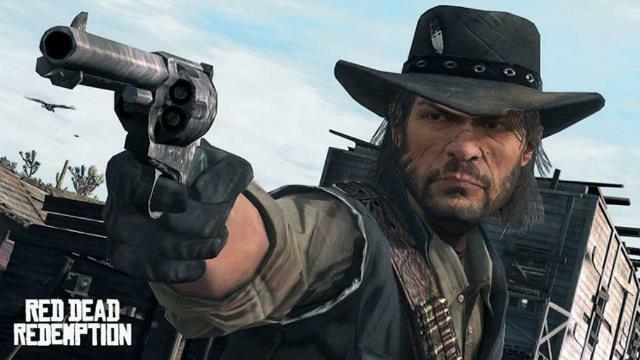 Is it the time and effort that went into shaping the story and characters of RDR, particularly protagonist John Marston? Is it the attention to detail and faithfulness to the time period in which it’s set? Or is it simply that Rockstar had more money and resources? In actual fact, it’s probably a combination of all of these factors and about a half-dozen more. Whatever the reason, Red Dead Redemption stands as the most successful and most popular Western videogame ever made, not to mention one of the most memorable games of this generation. A BRAVE NEW WORLD: Red Dead Redemption is set in 1911, in the penultimate year of what is historically considered to be the Old West, two decades after the eleventh US Census decided that the American Frontier as it had been known was no more, after the transcontinental railroads had shrunk the vast, untamed lands, after the instigation of the Bureau of Investigation and the birth of modern American law and order. The railroads had changed everything, from how fast news travelled across the continent to how fast new settlements and towns could be built, improving trading and relations, finally forging a governable nation that would one day become one of the greatest superpowers in the world. It was an era of advancement and prosperity, but also of confusion and uncertainty. Those still clinging to the old ways of the West were suddenly finding themselves outdated, outgrown by their own country. This was a world where the law had become powerful enough to corrupt the men who enforced it, but effective enough to vindicate the actions of those who misused it. It was also a time of eradication, as the forward-thinking government set to stamping out any last vestiges of the “Wild” West to make way for a brave new unified America. The Civil War was long done, slavery had been abolished in the northern States and, in the eyes of many, the West was well and truly won. THE COWBOY WAY: It’s a world that seems a perfect fit for Red Dead Redemption’s repentant protagonist John Marston. A former outlaw turned family man, John dreams of nothing more than raising his son, Jack, and running his farm alongside his wife, the sassy, independent one-time whore Abigail, and Uncle, an unwashed old rascal who has known John all his life. He’s happy to settle into a life of hard work and contentment, and put aside his wild ways as the country he lives in does the same. Unfortunately, such a peace will be hard-fought for. With his family seized by government agent Edgar Ross, Marston is charged to hunt and bring to justice the members of his former gang, starting with Bill Williamson, who is holed up at an old Fort in the middle of the prairie. It’s a task that fits Marston more snugly than farming, but it’s a life he has given up – even though he himself admits that he has never paid the penance for it. The story behind Red Dead Redemption explores such penitence, as John Marston sets out to find not only his former friends, but also his own absolution. Although capable and deadly, confident in his abilities, Marston nonetheless attempts to talk his way out of trouble more often than not. He’s a tough but simple man. As rugged as the land itself, Marston is possessed of a keen, street-smart kind of intelligence and approaches most problems laterally. It leads to some amusing altercations as he comes face to face more than once with the often-misguided pioneers of frontier science. SHOW ME THE WAY TO ARMADILLO: The game doesn’t truly begin until Marston confronts Williamson at his fort and is consequently shot and left for dead. After being rescued and revived by rancher’s daughter and desert rose Bonnie MacFarlane, Marston repays her kindness by performing tasks around the ranch, including driving cattle and breaking horses. It’s in these moments, which in a lesser game might be considered boring filler, that Red Dead Redemption first begins to shine. Driving cattle through a storm as the interplay between Marston and Bonnie hints first at mutual respect and then, tentatively, at potential romance (which, thankfully, never manifests) is impressive, as is the way Rockstar make you care about the secondary characters as much as about Marston himself. The period spent at the MacFarlane Ranch is a great way to convey the subtler nuances of Marston’s character, revealing that he was educated at a young age, that he can read and philosophise (even if it is largely accidental) and that he possesses a softer, more pensive side. It also reveals the directness of his nature, and the strength of his character. He won’t allow his good treatment to go unrewarded, and insists on helping Bonnie and her father fix up the Ranch while he gathers information on Williamson and the other members of his former gang from the nearby town of Armadillo. It’s a dangerous world, and one that Rockstar make no attempt to soften. As Marston you’ll witness kidnapped prostitutes, lynch mobs, bar fights, and take part in one-on-one duels that are used just often enough to always be tense and exciting. The crux of the game is Marston’s search for his old crew, but it’s shot through with dozens of distractions from playing poker and Liar’s Dice to treasure-hunting and sharp-shooting. Random encounters make up a large portion of the game, either with incidental characters you have to save or with the Strangers, people with specific needs that must be serviced in a certain way in order to rack up your overall completion percentage. Then there are the challenges, from gathering herbs to hunting specific animals, that start off incredibly easy but soon have you tasked with fighting a grizzly bear with just a Bowie knife. It’s easy to lose yourself in Red Dead Redemption, easy to get swallowed up in bounty hunting, arm-wrestling and trapping cute furry animals for their coats. The game is huge, and hitting that tricky 100% score will take anywhere from 30 – 50 hours. SIX-GUN LOVER: At ground level, RDR is a third-person cover shooter with a robust combat system that was leaps and bounds ahead of GTA IV. The cover mechanic is brilliant, and sees Marston kick up clouds of dust and sprays of snow as he slams himself against boulders, wagon wheels, tree-boles and broken walls. An impressive selection of rifles and pistols ensure that you’re always armed for bear, but the lasso is one of Marston’s most powerful weapons. Used to rope horses and wild animals or hog-tie wanted criminals to either be carried cross-saddle or else brutally dragged back to town, the lasso is quintessentially “cowboy” and absolutely great. Throughout the game, Marston will develop his shooting skills as he gets back into his old swing. The quick draw “minigame” is tense at first but a little too easy once you get the hang of it, but Marston’s Dead Eye skill is the real deal. At it’s highest level it lets you slow time to tag as many targets as you have rounds in your gun, meaning you can snipe multiple enemies from the back of a galloping horse like a badass centaur, or clip the rope of a hangman’s noose at 100 yards. Even cooler is when a certain challenge asks you to use Dead Eye to shoot hats off heads and guns out of hands. Taming wild horses, camping out on the plains and exploring abandoned mines, sheer cliffs and deep canyons in the search for treasure are, at times, as exciting as storming bandit camps or fighting off black bears. You can’t get bored in Read Dead Redemption. It simply won’t let you. 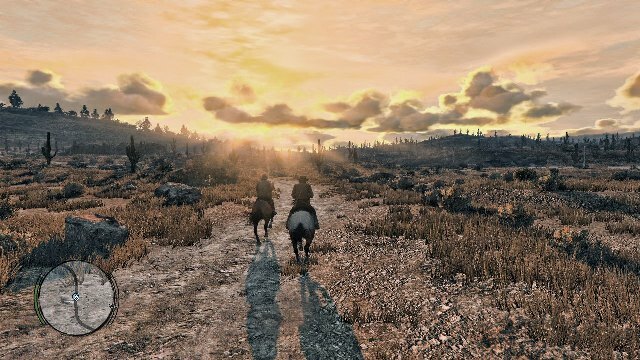 THIS UNTAMED LAND: Red Dead Redemption is certainly not a game to charge through. The world is enormous, and even a joy as simple as galloping your horse across the red desert, sitting at a campfire in the fading sun or hunting cougars through the rain and wind is worth taking the time to experience. It’s an idling game, one where you can ride around for hours and just deal with whatever comes your way, rescuing brides-to-be from lynch mobs, or narrowly escaping a bandit attack made possible by your gullibility in the face of a distressed damsel. 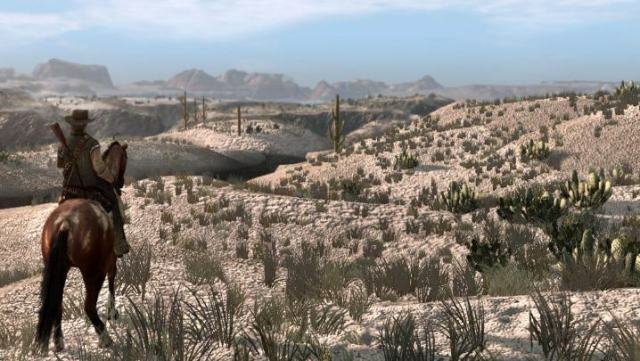 Even more so than Grand Theft Auto 4, the world of Red Dead Redemption is dynamic; it’s alive. The eclectic cast of secondary characters is one of the best Rockstar have ever produced, even by their eccentric standards and, while obeying certain Spaghetti Western tropes, each still manages to bring their own flavour to the world. From legendary gunslinger Landon Ricketts (who teaches Marston the highest level of the lethal Dead-Eye skill) to drunken gun-runner Irish and repulsive grave-robber Seth, the characters of RDR contribute to a compelling narrative that never stops surprising you, amusing you and addicting you. Whether you’re helping an aspiring movie director with a decidedly sinister project or overthrowing a Mexican tyrant and replacing him with what, at the time, seems a more noble prospect, RDR always has Marston front and centre. 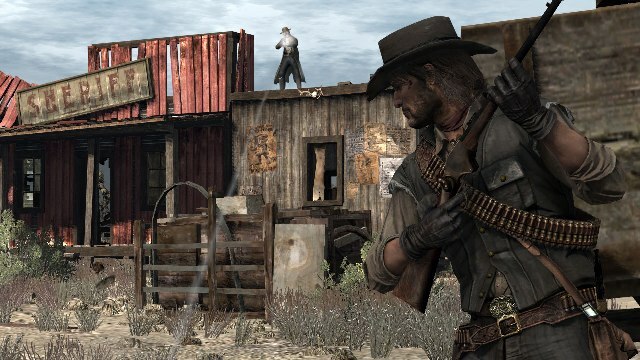 At times it plays almost like an RPG, placing an emphasis on character interaction, exploration and being Marston. Outfits convey bonuses or protection from certain factions, but they’re also a great tool for increasing the sense of immersion and authenticity. By the time you reach the last of the game’s three main areas and are on the trail of gang-leader Dutch Van Der Lind, you feel that you know Marston, that his pain is your pain, that it’s your family being kept from you. You’re tired, but in a good way, and you almost want it to end so that Marston can finally find some respite. BLESSED ARE THE PEACEMAKERS: When the moment finally arrives that Ross releases Marston from service, you’re given a single task that fills you with more anticipation and excitement than the previous 30 hours: Ride Home. With the deeply emotive tones of Jamie Lidell’s amazing Compass playing over your desperate ride, it’s the one and only part of the game where you won’t be tempted to do anything but what’s asked of you. It’s the only time a game has ever brought a lump to my throat, and I’m not ashamed to admit it. I was so invested in Marston’s plight at this point that I was almost overwhelmed. What follows is bittersweet, because you know that the happy ever after can’t be left to stand. His old gang is dead and Marston is back home in the arms of Abigail, but the quest for true absolution that has provided the driving power behind the narrative is unfulfilled. And when Edgar Ross arrives at the Marston farm with an army of Marshals, you know it can only end one way. With his wife and son in danger, Marston places himself in harm’s way for the last time, and commits the final act of martyrdom that cements him as one of gaming’s greatest anti-heroes. Besides one final mission as John’s son Jack that takes place three years later, the curtain is down, the story is over. Rockstar released the rather excellent expansion, Read Dead Redemption: Undead Nightmare but, while more Marston and, indeed, more Red Dead is great, the supernatural, B-movie style plot is nothing but an aside, an interesting take on what has gone before. It’s compelling, sure, but it’s a different beast to the main game and one that, regardless of its quality, can’t compete with Marston’s quest for personal peace and the safety of his family’s future. You may well stick around for the multiplayer, but while it’s a novel incarnation with legs to last, it’s not what RDR is all about. 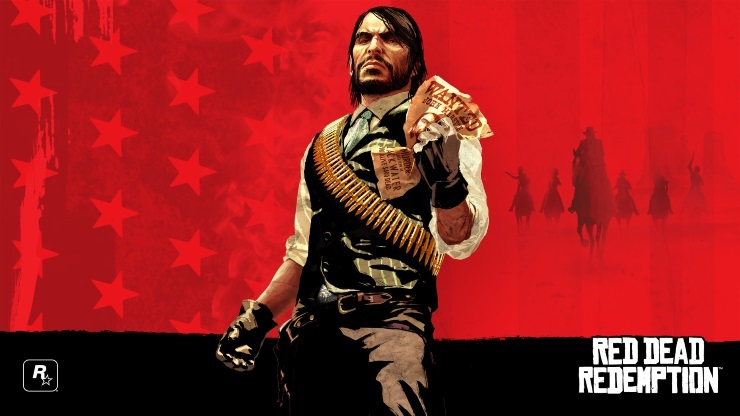 Red Dead Redemption is about John Marston, a relic of a dying world trying to adjust to the birth of a new one, who just wants to be free to live out his days in normalcy but who can’t easily lay to rest the baying demons of his past. 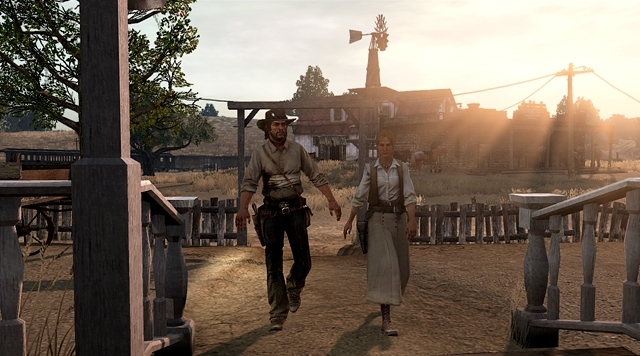 As a game, Red Dead Redemption stands apart as a fantastic example of open world role-playing and action gaming. As a story, it’s a tour de force of emotion and character that has never been bettered on this generation of consoles and – with the next gen creeping up on us with the same absolute inevitability that sunset will follow sunrise – probably never will. Red Dead Redemption was developed by Rockstar San Diego and published by Rockstar Games. It currently holds a Metacritic score of 95/100.